This could easily become your default breakfast dish for lazy weekend mornings, so consider yourself warned! They are addictive and once you’ve had a home-cooked version you’ll be left wondering why eggs n’ bacon in the States are served up so…boring? Green sauces work wonders on eggs so we’re bombing these Migas with a freshly made Salsa Verde. It’s worth giving the Salsa Verde a try if you’re new to it — it adds life to the dish and you can easily make it on the side while the Migas are cooking. 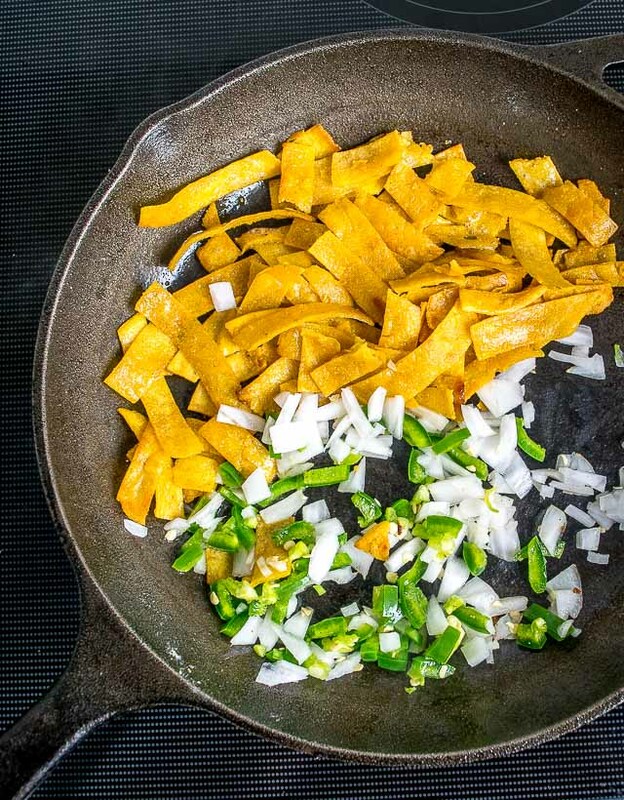 Don’t tell your partner that Migas came about as a convenient way to use tortillas that are past their prime. Tell them Migas is an authentic dish from a different era and they’re about to head back in time for some good eats. So yes, keep all your aging tortillas around because you can always bring them back to life in a batch of Migas. 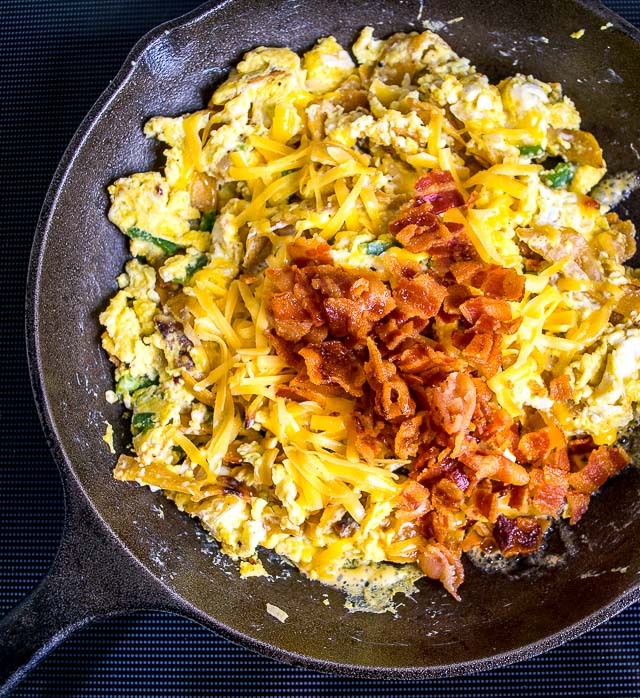 We’re adding bacon to these Migas (bacon!) but you can consider this optional if you want a vegetarian version. Lately, I’ve been using the oven to cook bacon, so we’ll hit two birds by cooking the bacon and roasting the tomatillos at the same time. The bacon will need 20 minutes in a 400F oven to fully cook. Tomatillos typically need about 15 minutes to roast, but it’s no biggie if you leave them in there a little longer. 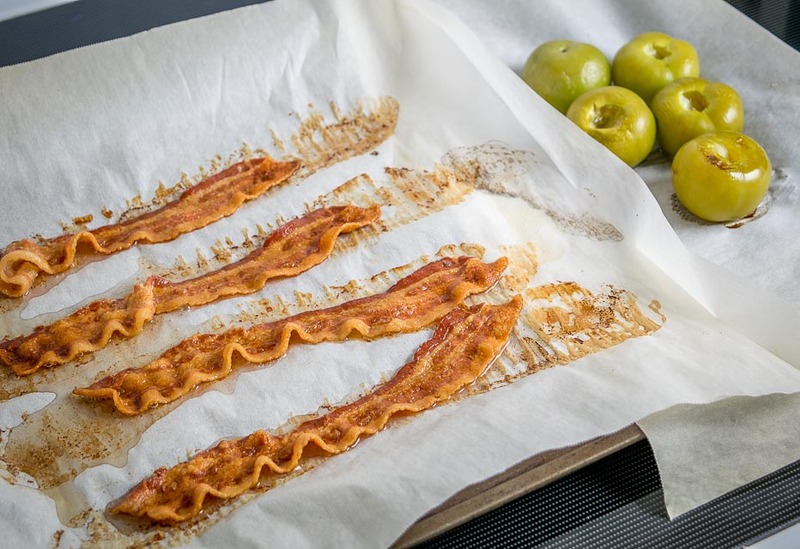 If you want, you can line the baking sheet with parchment paper for easy clean-up. Note: cutting out the stems of the tomatillos is an old habit from Mexico but this is optional. If you do cut them out be sure to pour any leftover juices into the blender when it comes time to make the Salsa Verde. While that’s cooking you’ve got time to prep the other ingredients. 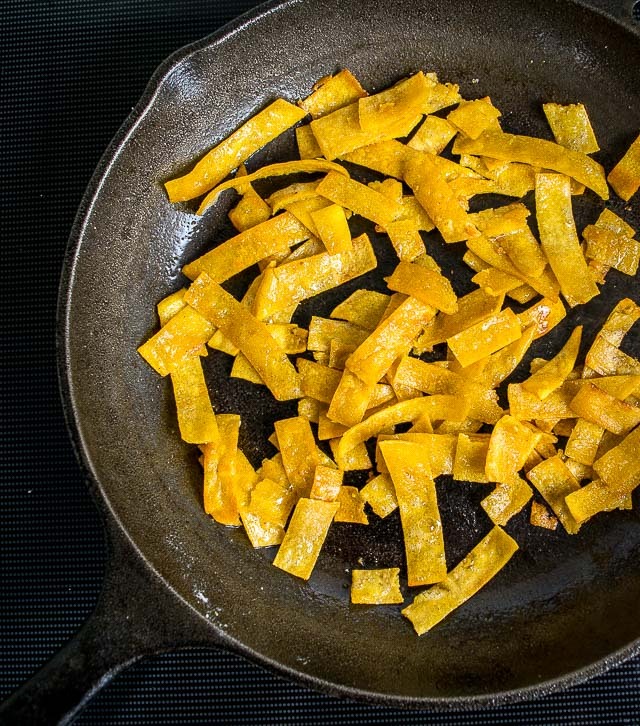 Heat up 2 Tablespoons of oil and 1 Tablespoon of butter in a skillet over medium-high heat. Add the tortilla strips and cook until browned, approx. 5-7 minutes. Add the onion and jalapeno and cook for a couple minutes until softened. If it seems like there’s not any oil leftover feel free to clear some space and add a glug of oil. Add the minced garlic and cook for 30 seconds or so, turning down the heat to medium-low. Whisk together six eggs and add them to the pan along with 1/2 teaspoon of salt and some freshly cracked black pepper. Let the eggs cook on medium-low heat, stirring regularly. Combine well and take a taste. Chop up the bacon and add it to the pan right when the eggs are on the verge of being done. We’ll also add 1/2 cup shredded cheese. Combine well and give a final taste for seasoning. If you’re not using bacon you might have to add a bit more salt. These are best served right away so garnish them with freshly chopped cilantro and chow down! Don’t forget to add a few spoonfuls of your lip-smacking Salsa Verde. There is something remarkably satisfying about eggs and semi-crispy tortillas all packed into one bite. And of course, well…bacon! 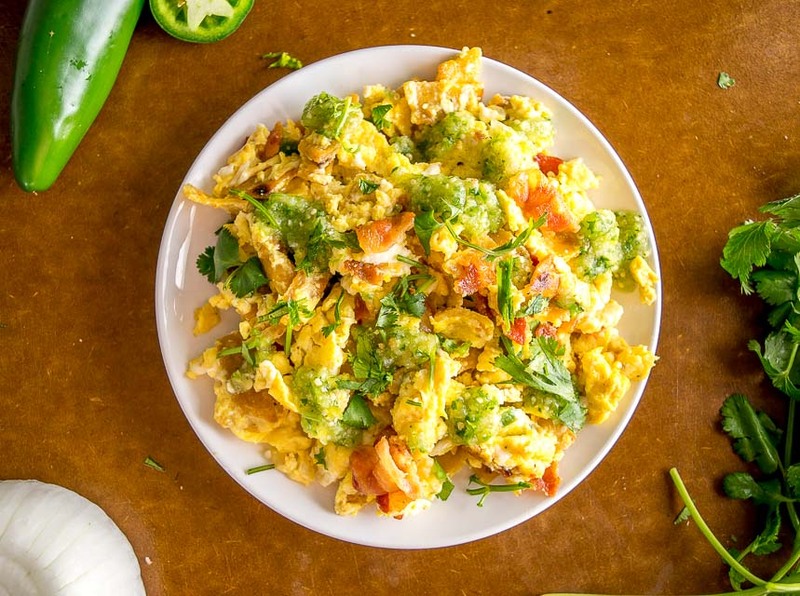 Give these Migas a try if your breakfast routine is getting a bit stale. They’re a great dish to add to your kitchen repertoire and they’ll instantly brighten up your morning. Plus there’s a decent chance you already have everything on hand to make them. Feel free to use the comments section below if you have any questions. 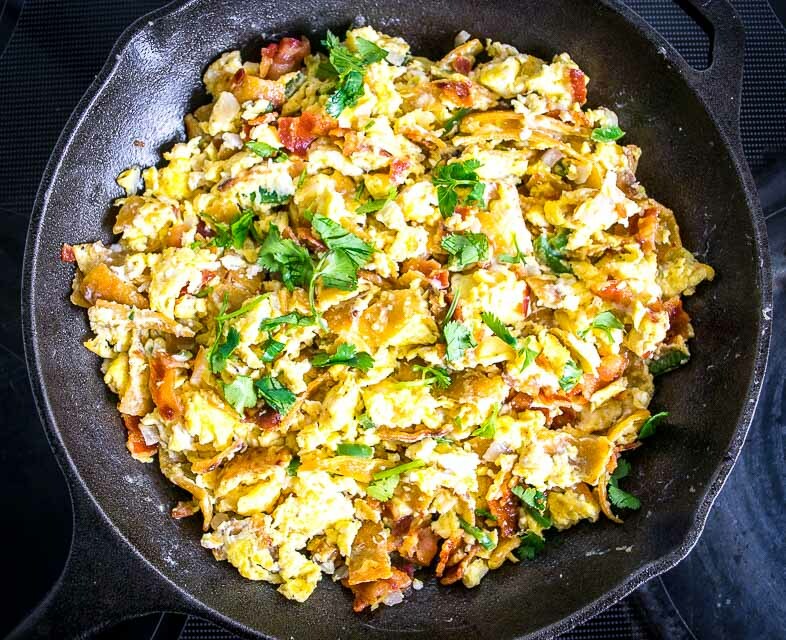 Migas are the perfect Mexican breakfast dish for lazy weekend mornings. We're topping this version with a freshly made Salsa Verde and it is delicious! Start by rinsing and de-stemming the tomatillos. 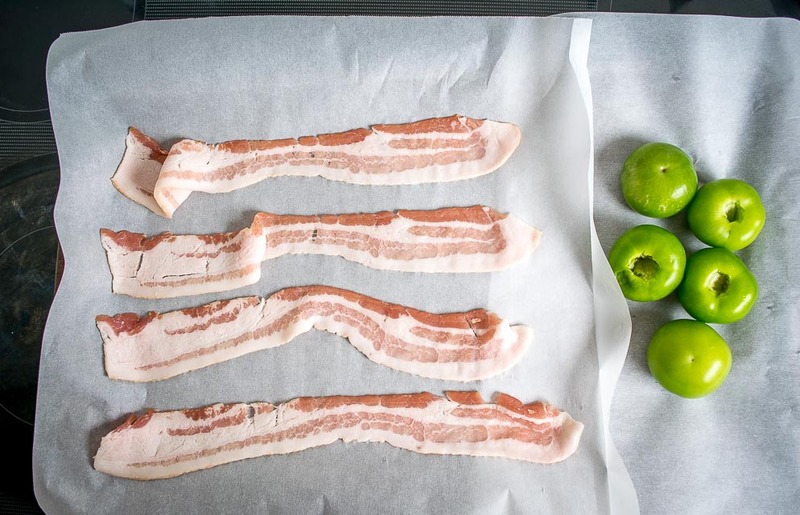 Add them to a baking sheet along with 4 slices of bacon. Cook in a 400F oven for 20 minutes. I line the baking sheet with parchment paper for easy clean-up. 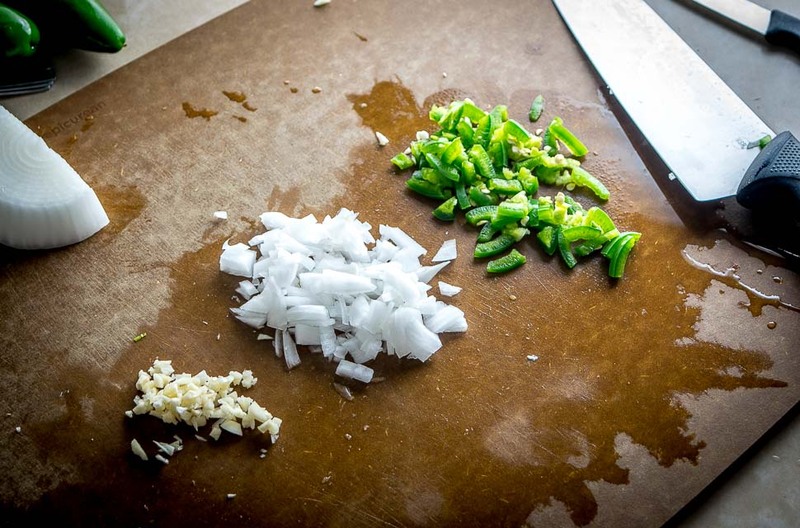 Finely chop 1/4 onion, 1/2 jalapeno, and single garlic clove. 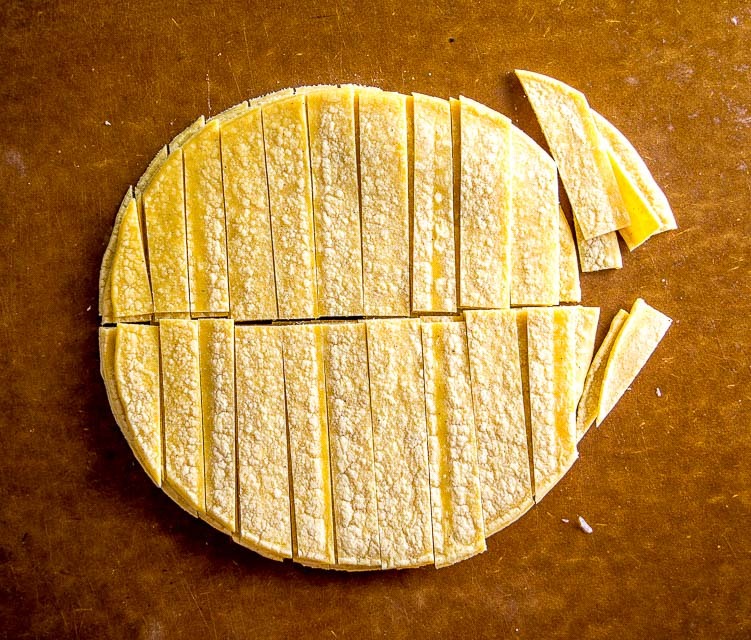 Cut the corn tortillas into thin strips approximately 1/4" wide. Heat up a skillet over medium-high heat. Add 2 tablespoons of oil and a single tablespoon of butter. When the oil is hot add the tortillas strips and cook until they are crispy and brown, stirring regularly, approx. 5-7 minutes. I usually add a pinch of salt here too. Add the onion and jalapeno to the pan and saute until they are softened. (You can add a glug of oil to cook the onion and jalapeno if you need to.) Add the minced garlic and cook briefly, 30 seconds or so. Turn the heat down to medium-low. Whisk together 6 eggs and add them to the pan along with 1/2 teaspoon of salt and some freshly cracked black pepper. 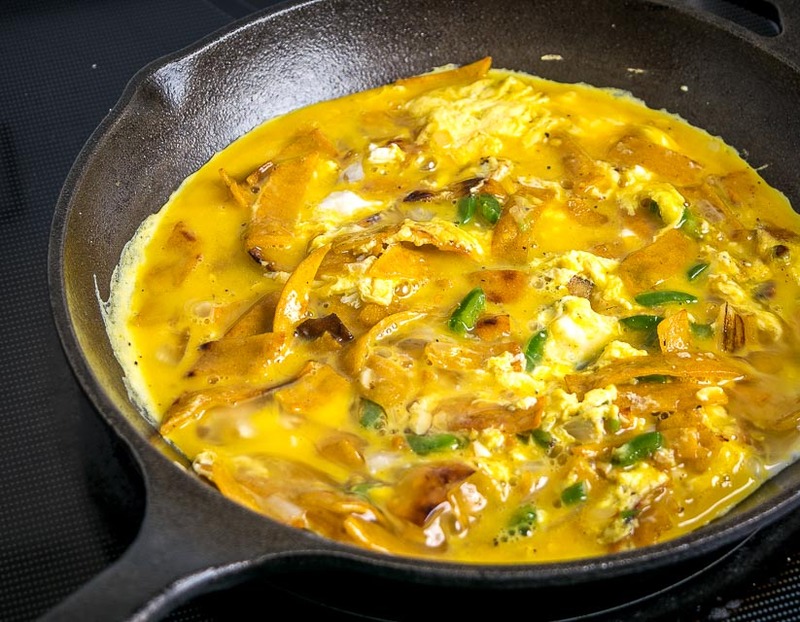 Stir regularly as the eggs cook over medium-low heat. Meanwhile, add the roasted tomatillos to a blender along with 1/2 onion, 2 jalapenos, 10-12 sprigs cilantro, and a single garlic clove. Combine well and take a taste. I rarely add salt to this Salsa Verde but you can add a pinch if you think it needs it. Note: 2 jalapenos creates some real zip so feel free to dial back on the jalapenos if you want a milder version. 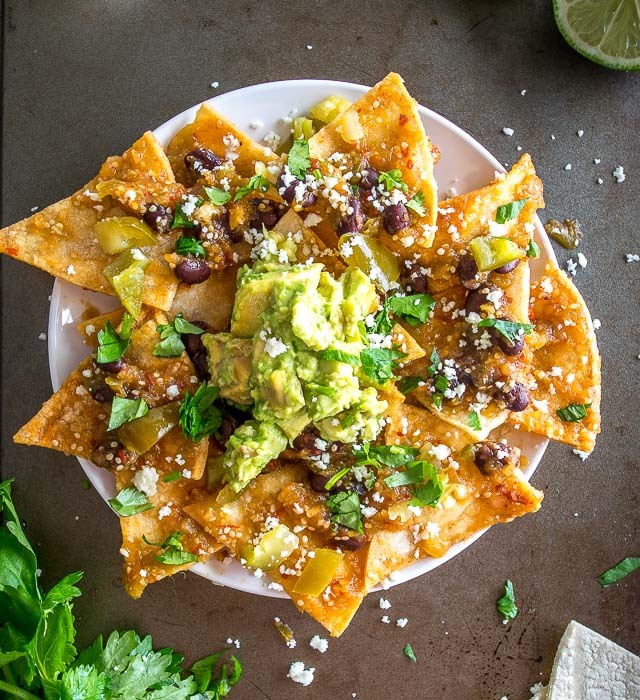 Garnish with chopped cilantro and serve immediately next to a bowl of your freshly made Salsa Verde so people can add a few spoonfuls at a time. We typically make Salsa Verde using serranos so feel free to use those if you have some on hand, but this version uses jalapenos and they work just as well. You might also like our Vegetarian Chilaquiles. 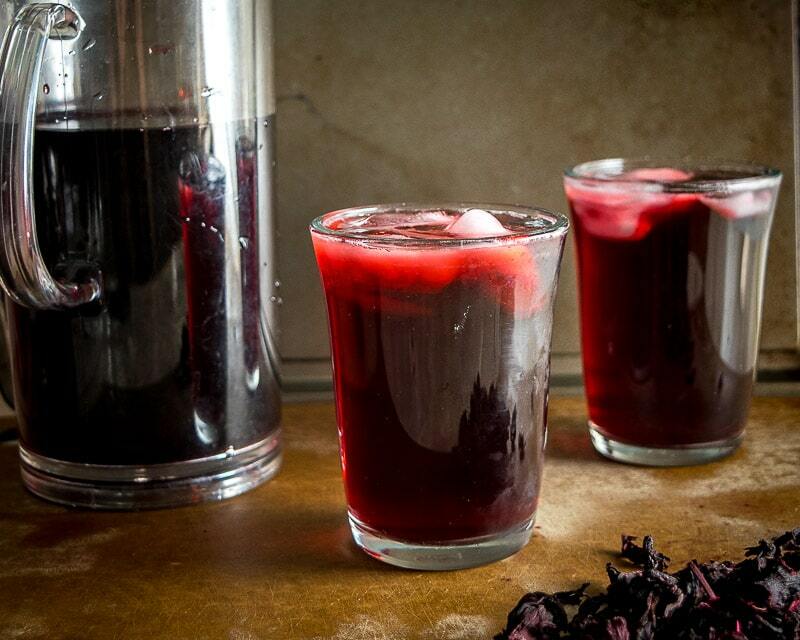 Our latest recipe is a batch of Agua de Jamaica. Looks good, needs tomato! I cook migas all the time. Add tomato and cheese late so as not to get the eggs all soupy or homogenous. Kudos for the inclusion of cilantro, that really provides a major kick in flavor. Green bell peppers are also good in addition to jalapenos (or my favorite, serranos). Don’t try poblanos, at least without roasting and peeling. I believe “migas” means “crumbs” (i.e. “leftovers”) so experiment! Thanks for the tips Jim! You’re right, definitely add the tomatos late otherwise their moisture mucks up the eggs. Cheers. This is a definite “holy cow!” Made this for lunch today, & it was a hit! Followed the recipe exactly, and it was perfect! In my experience, I’ve found that using older tortillas is best, as less oil/butter is needed to get them crispy. Keep up the good work, Patrick! Awesome thanks much for the feedback Esther! And good point about using older tortillas, once they start to dry out a bit they will crisp up easier. Glad you enjoyed them. Cheers. Made this dish this morning, a wonderful jump from boring eggs n’ bacon n’ toast. . Serving something this good and watching my better half enjoy it is so rewarding. Thank you for the muy sabroso recipes. Off topic here, I’m making your Carnitas slow cooker recipe for dinner. When its time to shred the pork I use a stand mixer and a dough hook. Saw the method on YouTube and have used it several times on beef and chicken also. 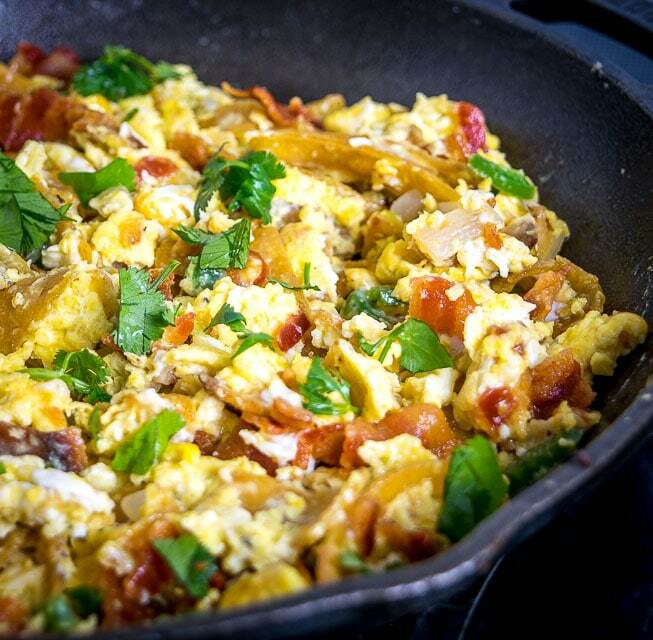 Awesome thanks much for the feedback on the Migas — so glad both halves are enjoying them! And thanks for the tip on shredding pork, never tried that before but sounds like it should work. Don’t forget to let the Carnitas soak in the juices for a bit after shredding them, I find this makes a huge difference in the final flavor. Cheers. Delicious! I wouldn’t add anything else. I’ve been cooking Mexican food for 40 years. I love your recipes and ideas! Keep it up! Thanks much for your feedback Kathy, so glad you liked these Migas! Your site is awesome! 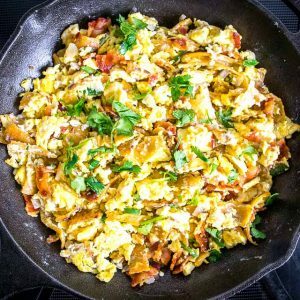 Tried this recipe this morning, and it was delicious! I also love your writing and the way you explain things. Thank you! Hey thanks for the feedback Elizabeth! So glad you like the Migas, I’ve been eating them non-stop for the past couple weeks heh. Migas were marvelous! Had them in Mazatlan in January and didnt know what they were but tried them and was quite pleased (for buffet food!). So made them on the weekend but left out the bacon (in favour of grilled sausages on the side) and added half of small tomato chopped when adding the chesse. Also “cheated” with pre cooked tortilla strips, worked just fine! Excellente and now is in Sunday brunch rotation. Salsa verde made it all come together. Made it the day before and with only one Jalapeno, gave lots of nice heat. Recommend, try it, you’ll like it! Thanks for your notes Douglas! 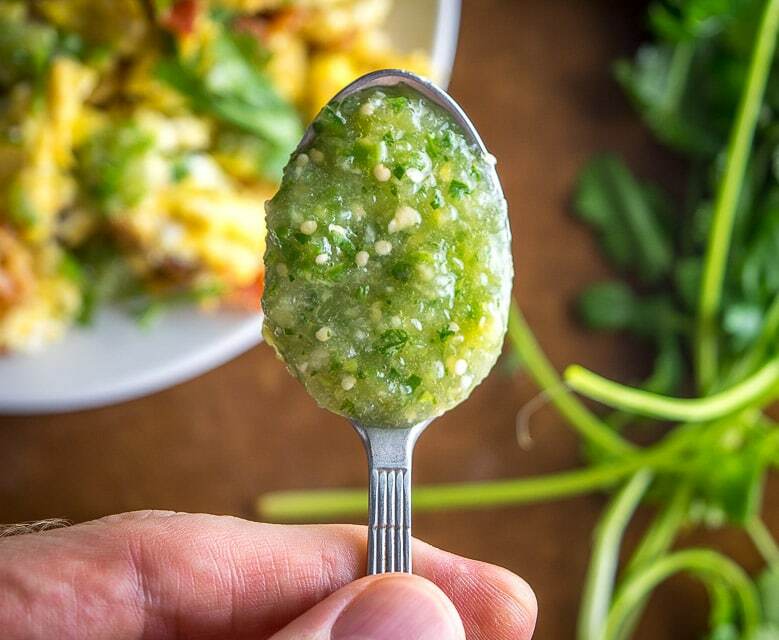 You’re right, the Salsa Verde might be the most important component as it seems to go so well with eggs. Cheers. I haven’t found the option to give this recipe 5 stars…..but I do! My Texan husband was surprised that his California raised Swedish wife could make migas that tasted like what he grew up eating. He did comment that he liked this salsa verde, but didn’t remember liking it before. Thanks! Your recipes never fail to hit the spot. Thanks Lee! So glad you found a keeper recipe in these Migas. Cheers.